Gravely Turf, an Ariens Co. The new diesel Pro-Turn 400™ series mower features a 25 hp Kubota® engine. Available in a 60- and 72-inch deck, the mower includes an air-suspension seat with added seat isolation. A rubber, isolated foot platform minimizes vibration. 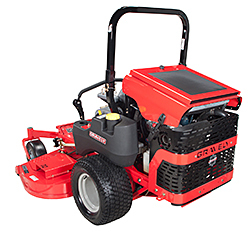 The mower also has a 13.4-gallon fuel capacity and large, flat-free front tires, a deck-lift system, a dial-adjust, height-of-cut system, and XL Spindles®.